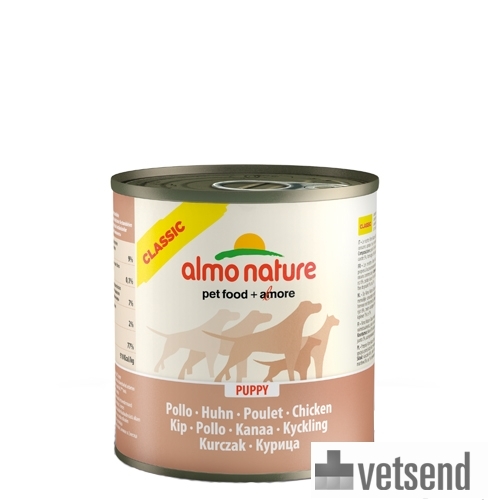 Almo Nature HFC Puppy Food is a complementary food for puppies made with only pure ingredients. Almo Nature HFC Puppy Food is a complementary wet food for puppies, made with only pure ingredients. This food formulated with a high percentage of chicken, and contains ingredients that are suited to the needs of puppies. However, this food should be complemented with dry food to ensure a balanced diet for your puppy. The chicken is free range, and no hormones or antibiotics were used during breeding. It is cooked without the use of chemicals, and preserved in its own juices to maintain the natural nutritional value and flavour. As with all Almo Nature diets, no chemical preservatives or colourings are added, making it a healthy, simple and pure supplement for your puppy. HFC Puppy Food is available in chicken flavour, and comes in 12 individual portions of 280 grams. Chicken (45%), chicken broth (31%), rice (6%), sweet potato (5%), carrot (5%), cheese (3%), sunflower oil (3%), chicken liver (1%), eggs (1%). Have you used Almo Nature - HFC Puppy Food before? Let us know what you think about this product.